Concrete driveways and garage stains are more than just a nuisance. They can lower the value of your home, create health hazards to children and pets, and cause stains to be tracked into your house or car. But is it possible to completely remove an oil stain that had penetrated deep into driveways or garage floors? How about in a commercial setting? Fuel islands at gas stations, warehouse floors, and drive through lanes at banks and fast food restaurants are but a few of the places that oil can penetrate into the concrete. With new technologies, and FDA approved methods, it is now possible to completely mitigate oil and gas from concrete surfaces. The process involves going below the oil and forcing it to the surface where it can be removed by enzymatic cleaners. Once mitigated, the hydrocarbons can be safely removed using degreasing products. 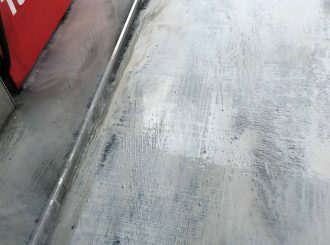 Additionally, with the application of a ceramic based sealer, you can be assured that no oil and gas will be able to penetrate those surfaces again!